Sales of toilet paper in Japan have increased by 500 million rolls since 2008, despite a steady decline in the country's population in the same period, it seems. According to one of Japan's largest paper manufacturers, growing demand for toilet paper stockpiles in case of natural disasters has led to a prolonged spike in sales, the Yomiuri Shimbun newspaper reports. "So why is toilet paper use going up when the number of people using it is supposedly going down?" the paper asks, pointing to the aftermath of the 2011 earthquake in which toilet paper disappeared from the shelves of shops for the answer. The temporary shortage led to the government to urge people to hold at least one month's supply in their homes, with one housewife telling the paper that she had enough toilet paper in her home to stretch 3.9km (2.4 miles): "They don't go bad, so knowing that we have them on hand is a relief," she said. The recommended stockpile is 15 rolls, the paper says. Another factor is the introduction of luxury products, the Daio Paper Corp says. 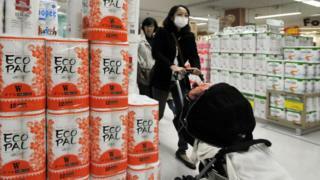 Two- and three-ply rolls are only half the length, leading to people simply buying more, the company tells Japan News. Even with sophisticated electronic toilets, the company's own surveying found that absolutely nobody trusted the built-in drying function, and still used paper. A final factor is social: Public toilets are now supplying users with paper instead of expecting them to bring their own, after years of inconveniencing foreign tourists who have been caught out by the tradition. The days of toilet paper vending machines appear to be ending as virtually all conveniences now come fully equipped with paper. Speaking to Yomiuri Shimbun, Professor Takanori Shintani said the trend is rooted in the national character of Japanese who desire cleanliness above all else... The notion that 'thrift is a virtue' has worn off."